We’re all used to cow’s milk alternatives, including goat, sheep and even legume and nut milks like soy and almond. Another milk alternative is gaining traction with curious American consumers: camel milk. Technically, camel milk isn’t new. Milking and riding camels is extremely common elsewhere, particularly in native camel habitats. There are two main types of camels, the dromedary or Arabian camel, the one-hump camel found in Africa, the Middle East, and Australia; and the Bactrian, the two-hump camel found in Central Asia. Milking either type, the result is the same. Camel milk has 2 percent milk fat, a creamy white color and a sweet, slightly salty aftertaste. Gil and Nancy Riegler established Oasis Camel Dairy near San Diego, California, a decade ago, when it was first – and only – camel milking dairy in the United States. Even now, there are only seven camel milking facilities in the U.S. At the Camelot Camel Dairy in northeastern Colorado, Kyle and Holly Hendrix are building a new state-of-the-art processing and pasteurization facility at their Camelot Camel Dairy, hoping it will be the first Grade A camel dairy in the U.S. Regulation on camel milk varies widely, with most camel milk drinkers still buying from small farmers or within membership associations. In June, a camel milk dairy and distributor, Desert Farms in California, started selling camel milk in California Whole Foods stores for $18 a pint. Camel milk advocates reference studies demonstrating that the anti-inflammatory beverage will soothe symptoms of Crohn’s disease, IBS and diabetes thanks to its low sugar content and high levels of protein and vitamin C. Some have even suggested camel milk can improve autism-related symptoms (though the science remains up in the air on that claim). For the Rieglers, producing camel milk products like lip balm and an unusually silky lotion is also a major focus. They even sell camel milk chocolate imported from the United Arab Emirates. 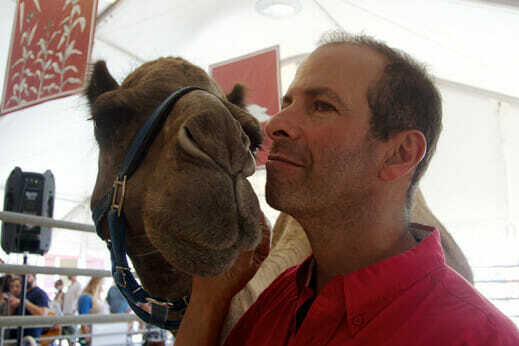 Even with a gentle disposition, milking a camel is no small task. Unlike cows, which can be separated from calves immediately after birth and keep producing milk, camels must be encouraged by their babies to “let down” their milk. When a calf nuzzles its mother’s udder, the release of oxytocin in the mother’s brain triggers muscle contractions, which causes the milk to drop. The calf’s tail will go up in anticipation, and all four of the mother’s teats will fill up like water balloons. The muscle contractions also cause a camel to suddenly become very still and blink hard several times, sometimes even shedding a tear or two. (If you’ve seen the 2003 German documentary, “The Story of the Weeping Camel,” you know how true this is.) It’s one of the only ways to tell when it’s possible to milk. You must be quick. The milk is available for just 90 seconds at a time. When the Rieglers see one of the mothers is ready to give milk, they’ll offer both mother and baby high-protein grain and hay while they double up, using all four hands to milk the four teats as quickly as possible. After a 10-minute break, the mother will be ready to drop her milk again, at which point they’ll let the baby nurse. Camel calves nurse for the first 12 to 18 months. There’s no limit to the amount the mother will produce, so as long as the baby can prime the mother, milking can continue. Even raising a herd can take considerable time. Mother camels gestate their 75 lb. calves for 13 months. All that waiting, and when it’s finally time, the birth tends to take just 20 minutes. Typically, camels live 35 to 40 years old. The Rieglers’ oldest is 28 and going strong. They hope she’ll have another baby next year. 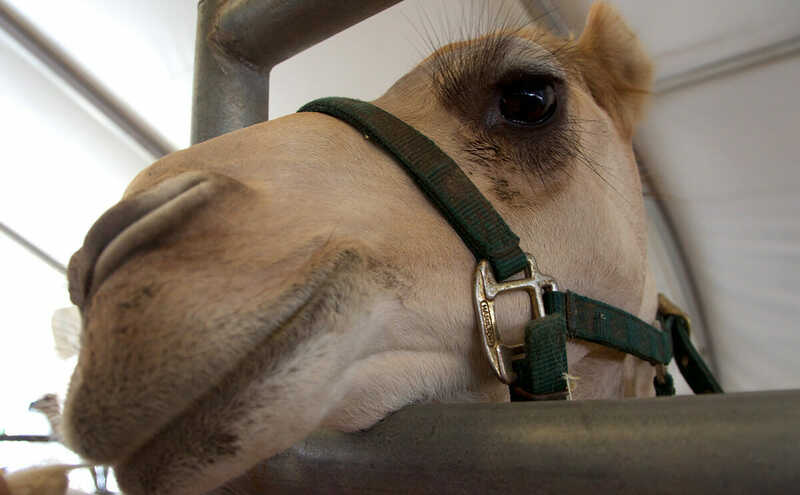 Despite difficulty procuring the milk (and some sidelong glances from fellow farmers), the milk’s benefits and a growing population seeking another alternative to traditional cow milk means camel milk may finally make it over the hump in the United States.